While your pie crust chills (the recipe I used suggested chilling 30 minutes), combine strawberries, sugar, and tapoica starch in a medium bowl. Stir to combine. When pie crust is ready, lightly dust a large flat surface for rolling out your dough with flour. Add your pie crust. Rub flour on rolling pin. Roll pie crust out to a pretty thin level (between 1/4 – 1/8 inch thick), turning dough as you go so it doesn’t stick. Use a 2 1/2″ heart-shaped cookie cutter to cut out 20 heart-shaped pieces of dough. Set aside remaining dough. Note: You may have noticed I cut some to a smaller size in some photos in this post, but I found the 2 1/2″ version worked better – feel free to use whichever size you prefer. Move half of the pieces of pie dough to the prepared baking sheet. For each mini pie: Brush dough with egg wash, top with strawberry mixture (try to avoid adding liquid as you go), add about 1/2-1 teaspoon of nutella if using, top with another piece of dough, matching edges and pressing to seal. Press on the edges with the ends of a fork to help seal. Repeat for the rest of the mini pies. Cut small slits into the tops of each mini pie (I cut little arrows for the Valentine’s Day theme), brush with egg wash, and sprinkle with sanding sugar. Bake for 22-24 minutes or until tops are golden brown. While mini pies bake, prepare the hand pie. Gather the rest of the dough, bring pieces together to one ball, and roll out to about 1/4 inch thick, turning dough and adding flour as necessary to prevent sticking. Note: I left my pie pretty free-form – I didn’t worry about making a perfect circle. Prepare another baking sheet with parchment paper (or aluminum foil with a light coat of non-stick spray). Carefully transfer the hand pie dough to the baking sheet, centering half of the dough (since you’ll be folding it in half soon). Spoon the rest of the strawberry mixture (trying to avoid adding the liquid) to half of the dough, leaving a roughly 1/2 inch border and the other half of the dough. Add about 1/4 cup of nutella, spreading around strawberries, if using. Brush the edge with the egg wash, fold the dough in half pressing the edges to seal. Press on the edges with the ends of a fork to help seal. 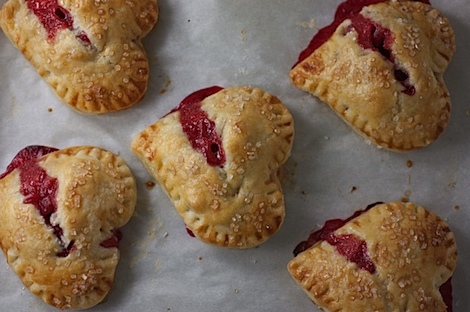 Cut small slits into the top of the hand pie (I cut “LOVE” for the Valentine’s Day theme), brush with egg wash, and sprinkle with sanding sugar. Bake for 24-26 minutes or until the top is golden brown. Allow each batch (the mini pies and the hand pie) to cool before eating. Optional icing step: If you don’t use nutella, you’ll probably want to add a bit of icing. I made a quick icing using a mixture of confectioner’s sugar and orange juice, which I just whisked quickly (starting with about 1 teaspoon of the orange juice and adding more as needed) in a bowl and drizzled over the cooled mini pies.